My father’s birthday was at the beginning of the month. A few days before his birthday, I asked him what he would like because he is really hard to match with a good gift. Unless it is bald eagles, firefighter related or Santa related, he is usually hard to peg. Seeing how he already has a ton of those three things, I was trying to go different. So he tells me that he wants an American Flag bow tie. It is no simple feat to find a decent looking(not cheesy or corny) American Flag bow tie. Most places I found would not have the tie here in time so I opted for an Amazon giftcard to use with his Kindle and saved the bow tie idea for Christmas. 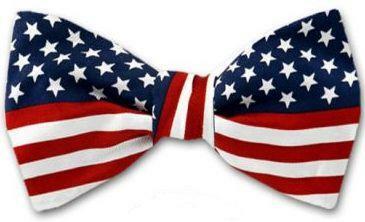 Now is the time to find the perfect American Flag bow tie so it will ship in time for Christmas. I have found several companies that sell them but I they all still look a bit too cheese to me. Before I can settle on one, I have to ask the more important question that bow tie wearers, of which my father has never been, prefer – pre-tied or self-tie. It turns out it was to be self-tie. After viewing countless tacky bow ties, I finally settled with Buy Your Ties. It is a silk American Flag, self-tie bow tie for $14.95. Bonus: If you don’t mind a little wait the shipping can be free.